The driveway this winter has progressed through a somewhat regular and recurring rotation of fresh snow, slushy post-rain puddles, and the thick ice that forms when temps drop from well above freezing to well below. There is no consistency to winter anymore, it seems. We survived the deep freeze of Christmas week, whose brutal cold sapped our energy and made our fingers and toes ache. By the end of those two frigid weeks, even the most outdoor-loving of my outdoor-loving kids was content to stay inside when he could. The January Thaw came twice – both the week before my birthday and the week after. I don’t remember all the specific weather details, but somewhere in there, between the rain and thawing, it snowed enough that we had to shovel the roof, brush off the car, and plow the driveway several times. 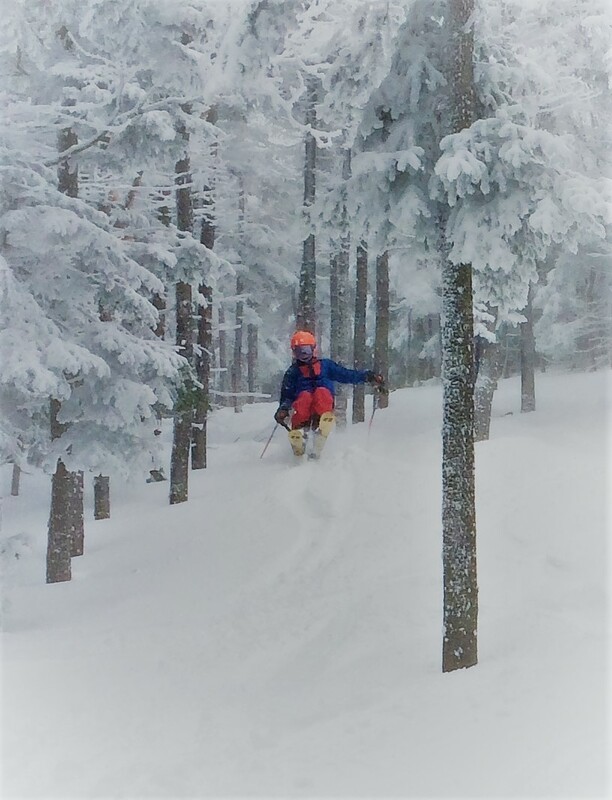 The first week of February, I let my kids skip school one day to ski a foot of new powder. When I tossed that idea out to my husband, feeling a bit guilty about the missing-school part, he was immediately on board (although, sadly, he still had to go to work). We only get so many powder days in a winter – or a lifetime – after all. The kids dragged me through every puffy-with-new-snow glade they could find, and we stayed out well into the afternoon. I guess it was good we had that day, because this Tuesday I wore my rain pants and muck boots to the mountain for my coaching gig. Out of a small vacation week group, I had only two intrepid 7-year-olds join me for a morning of slushy-icy runs and wet chairlift rides. As we went in for our mid-morning break, I wrung the water out of my sopping mittens. The kids didn’t seem to mind. They chatted happily on the chairlift, practiced the rainy day drills I assigned them, and skimmed cheerfully through slushy puddles to get from one place to the next. The last three years, we’ve had similarly wacky winter weather during the two weeks of February break that are traditionally the busiest ski weeks of the season. Last year, for the first week, when out-of-state skiers are on vacation, we had fresh snow and beautiful weather. The New Hampshire kids got rain and ice the following week, but they didn’t batt an annoyed eyelash. I have a photograph, somewhere, of my crew from two years ago standing in a deep puddle at the top of a chairlift. They gleefully slid through that puddle – and another one at the bottom of another lift – every run that day. I’m glad the kids go with the flow, and I try to match their enthusiasm for skiing in the rain. But maybe they don’t mind because it’s such a regular occurrence in their young skiing lives. I can remember only a handful of rainy ski days in my entire childhood. Tuesday one of the other coaches, a guy who’s on the hill six days a week, said it was his eleventh day this season skiing in the rain. Rain ponchos and serious rain pants – like the kind fishermen wear – have been added to many a ski coach’s wardrobe. My own kids, like the good New Englanders they are, will ski in just about any kind of weather: howling wind, 40 below, sleet, snow, ice, sunshine. But like me, they are dismayed by the recurring winter thaws that no longer stick to a few days of January. “This is sad,” my 9-year-old proclaimed Wednesday morning, as she exited the house jacketless and looked out on the snow-less field and the mud bog of our driveway. All I could do was agree – and hope for another swing toward winter before spring sets in for good. Original content by Meghan McCarthy McPhaul, posted to her blog, Writings From a Full Life. This essay also appears as Meghan's Close to Home column in the February 23, 2018 issue of the Littleton Record. I can see them when I sit at the living room window on winter evenings, or when I go out to take one last peek at the sky before bedtime, checking the stars, sniffing hopefully for the scent of snow about to fall, looking to the mountain for the groomers in their nighttime dance. 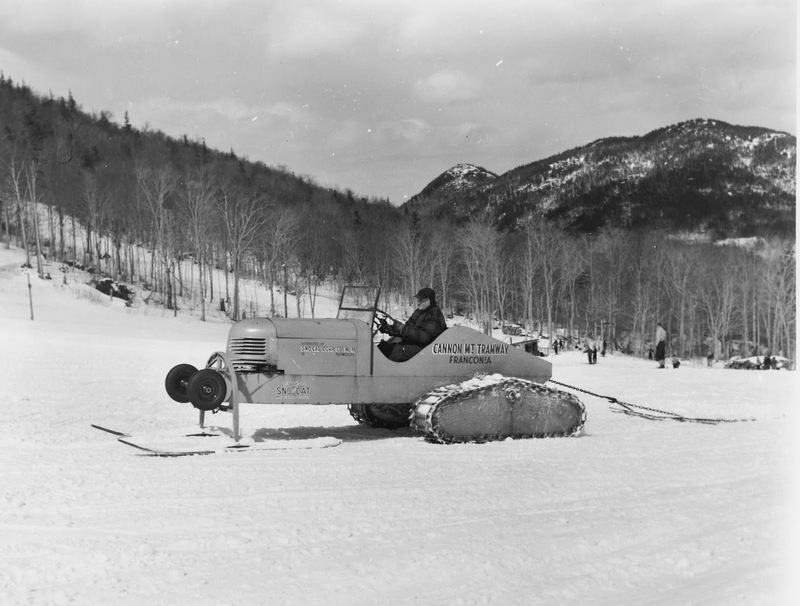 We've come a long way since this old Tucker Sno-Cat! Sometimes there is only one on our side of the mountain, a solitary light moving slowly along. Often we can see two or three, and on rare occasions all four snowcats, working their different parts of the mountain, moving along trails disguised by night’s darkness. 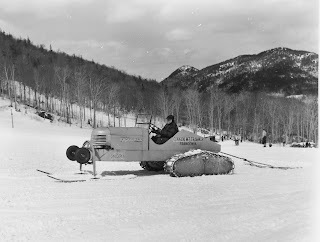 The bright lights seem synchronized in their slow up-and-down, to-and-fro motions, although surely the snowcat drivers can’t see each other as they work, cleaning up the day’s mess of bumps and ruts and uncovered ice, planting neat rows of corduroy as they go. A couple weekends ago, as I drove back up Three Mile Hill toward the mountain for an evening function, I watched one cat crawl up Middle Ravine (perhaps) and another down what I figured to be Skyline on Mittersill. I smiled at the glow of cat lights moving on the mountain I know, have known for as long as I have known anything, but only by day. What do the trails look like in the dark, bereft of the skiers who congregate there for their daily bread, their freedom, a few hours of joy – all during daylight hours? The groomers know. They know a landscape apart from the one so familiar to so many: the same contours from a different perspective. In mountains, as in life, perspective is critical – and constantly shifting. Have you ever looked at a familiar mountain from a different angle and not been able to name it? Or climbed to the top to see it up close, rather from the distance of town? Or considered a problem from a different potential solution, a sentence with a different twist, an opinion from someone else’s point-of-view? Fluid and quiet from afar, I know the snowcats are noisy when close, that the hard blades of their tracks churn through the snow and ice as they move. Leaving well-swept snow in their wake, they are a juxtaposition of power and grace. A couple of Sunday mornings ago, the temperature dropped after the trails had been groomed, creating a solid, slippery, and unsafe surface. Back up the mountain the groomers went to refurbish the trails. From below, the little ski racers I coach on weekends watched wide-eyed as the cats moved along familiar trails, fixing them up just for us. Some evenings, my own children look for the snowcats during dinner, gazing from the dining room table, out through the early dark of winter, toward a light or two or three moving along the mountain. In the mornings, when the sky is pre-dawn slate, just lightening to peach along the mountains’ silhouette, we can usually spot a groomer putting on the finishing touches, making one last pass before the skiers arrive. The cats leave the snow ready for edges to carve, for skiers to find their Zen moments – in short, quick turns or fast, sweeping ones across the fall line. A day’s worth of skiers marks the once-smooth canvas into countless cuts and divots, slices and ruts, leaving it muddled and choppy. And as night falls, the groomers take to the mountain again, and we watch their dance from afar. Original content by Meghan McCarthy McPhaul, posted to her blog, Writings From a Full Life. This essay also appears as Meghan's Close to Home column in the February 9, 2018 issue of the Littleton Record.